An ultrathin film that is both transparent and highly conductive to electric current has been produced by a cheap and simple method devised by an international team of nanomaterials researchers from the University of Illinois at Chicago and Korea University. The film – actually a mat of tangled nanofiber, electroplated to form a “self-junctioned copper nano-chicken wire” – is also bendable and stretchable, offering potential applications in roll-up touchscreen displays, wearable electronics, flexible solar cells and electronic skin. The finding is reported in the June 13 issue of Advanced Materials. “It’s important, but difficult, to make materials that are both transparent and conductive,” says Alexander Yarin, UIC Distinguished Professor of Mechanical Engineering, one of two corresponding authors on the publication. The new film establishes a “world-record combination of high transparency and low electrical resistance,” the latter at least 10-fold greater than the previous existing record, said Sam Yoon, who is also a corresponding author and a professor of mechanical engineering at Korea University. The film also retains its properties after repeated cycles of severe stretching or bending, Yarin said – an important property for touchscreens or wearables. 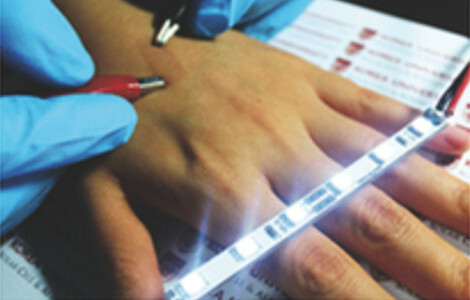 Manufacture begins by electrospinning a nanofiber mat of polyacrylonitrile, or PAN, whose fibers are about one-hundredth the diameter of a human hair. The fiber shoots out like a rapidly coiling noodle, which when deposited onto a surface intersects itself a million times, Yarin said. The naked PAN polymer doesn’t conduct, so it must first be spatter-coated with a metal to attract metal ions. The fiber is then electroplated with copper – or silver, nickel or gold. The electrospinning and electroplating are both relatively high-throughput, commercially viable processes that take only a few seconds each, according to the researchers. “We can then take the metal-plated fibers and transfer to any surface – the skin of the hand, a leaf, or glass,” Yarin said. An additional application may be as a nano-textured surface that dramatically increases cooling efficiency. Yoon said the “self-fusion” by electroplating at the fiber junctions “dramatically reduced the contact resistance.” Yarin noted that the metal-plated junctions facilitated percolation of the electric current – and also account for the nanomaterial’s physical resiliency. Co-authors include Yoon’s predoctoral student Seongpil An of Korea University, Mark T. Swihart of the State University of New York at Buffalo, and others. Funding was provided by the National Research Foundation of Korea.